Chaps, have you ever just blasted the bottom and run a boat that way?? Curious on what it does? I've been told by a boat builder that alum sticks to the water and blasting the bottom "releases" the hull and makes a smoother/drier ride?? I've heard that as well but can't vouch for the veracity of it. I know the guys with aluminum drift boats have a problem with getting stuck on river rock and they have to coat the bottoms with hard epoxy, I do those jobs too. I could imagine that smooth aluminum may develop a suction effect on smooth water and that a stippled bottom might overcome that but can't say for sure. If its true then it would seem that smooth glass bottoms would also have the issue . . .
Chaps wrote: I've heard that as well but can't vouch for the veracity of it. I know the guys with aluminum drift boats have a problem with getting stuck on river rock and they have to coat the bottoms with hard epoxy, I do those jobs too. I could imagine that smooth aluminum may develop a suction effect on smooth water and that a stippled bottom might overcome that but can't say for sure. If its true then it would seem that smooth glass bottoms would also have the issue . . .
That's great. Wish you were closer. Take some before and after pictures. What does it use to clean with? How have the jobs come out compared to wet sand/sand/water blasting? The machine shoots a crystallized mineral (not sand). When the mineral grains hit a surface they shatter which is what does the paint removal. Also, it goes on damp so there isn't any dust plumes like you get from soda blasting and dry sand blasting. We got it done with a combo of soda and sand and what a mess.We, would have definitely used your system. The boat is at the Line X shop this week for 400 sq/ft of non-skid. Then it is going to paint after. Then bottom paint. Thanks for all the advice and support! When it comes time to completely strip and replace the bottom paint and barrier coat, we will have to employ your services. I have pictures, just need to figure out how to post them. Wow, wish you were in the Northeast, how does it leave gelcoat after bottom paint is removed? I have read it is the least damaging to gelcoat and in some cased the gelcoat can be buffed out after stripping instead of repainting. Knight Hawk, go to your , User Control Panel and click on the GALLERY tab and follow directions , it's easy , heck even Jettywolf did it. If that don't work , Email them to me and I'll post them for you . MacCTD wrote: Wow, wish you were in the Northeast, how does it leave gelcoat after bottom paint is removed? I have read it is the least damaging to gelcoat and in some cased the gelcoat can be buffed out after stripping instead of repainting. Normally the goal is to leave a #80 profile (ideal for new bottom paint or barrier coat) which is achieved with the medium sized crystal grit. If I use the finest grade of media it leaves a very smooth finish but it takes longer to remove the paint. I did one boat where the expectation was to buff the bottom and not repaint but what we found underneath was that a very rough original prep job had been done to the gelcoat and would have been too much work to straighten out so the client repainted in a hull color matched Vivid and it looked fine. AlloyToy wrote: Chaps, have you ever just blasted the bottom and run a boat that way?? Curious on what it does? I've been told by a boat builder that alum sticks to the water and blasting the bottom "releases" the hull and makes a smoother/drier ride?? 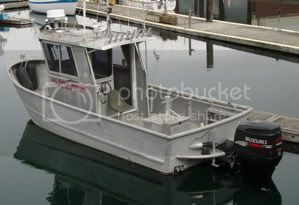 Since I live in Tacoma and it is not far the BB Island for me, I'd like to make a suggestion for the good of AAB memebers..I would volunteer my boat bottom to be blasted and take some informal speed readings using the GPS... But there are many other factors that I have experienced with glass boats. I do know that I have run faster with a very clean waxed bottom. By clean it was trailer kept so no growth! Also Clean means no road grime, tar spots or such! It is amazing how a small bit of tar stuck the the hull thrown up by the trailer wheels can slow you down...Also a lip caused by improper trailer support at the transom can cause a change in attack angle and slow you as well! Well Capt PJ your results of your test are? The git er dun didn't happen this past summer! No results...I did put a coat of wax on the bottom and I don't really know if it made a diff...no measurable results...but what I do know is that the stuff sticking to the bottom when hauling out at a dirty ramp with floating scum is much less to wash off. So I suspect there is some help! THX for asking.